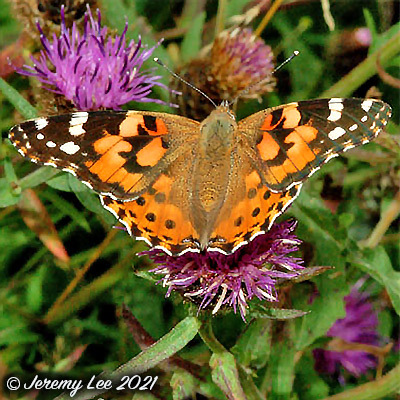 Cynthia cardui, more commonly known as the Painted Lady, has a wingspan measuring 5 - 6cm. Upper wings are pale orange with black spots, also with white spots on forewing; underside of hind wing with a row of five eye-spots. Throughout the UK, almost everywhere during the migratory season, but thereafter mainly in open countryside and suburban gardens. Regularly migrates in spring, usually in small groups from southern Europe, northwards across the Alps. Populations increase greatly in summer, then die out in autumn. Usually seen in the UK from late April onwards. Two or three broods from June to October, then return migration in autumn. Feeds on flowers and fallen fruit; eggs laid singly on leaves of the caterpillar's food plant. The caterpillar is grey or black, with yellow stripes on the sides. Feeds on various thistles, nettles, mallows and many other plants.